Easily the most widely-known and visionary architect in US history, Frank Lloyd Wright designed incredibly unique and beautiful homes, churches, and other assorted architecture in his organic, “Usonian” style. It often featured broad, flat edges, dramatic angles, and unique building materials. 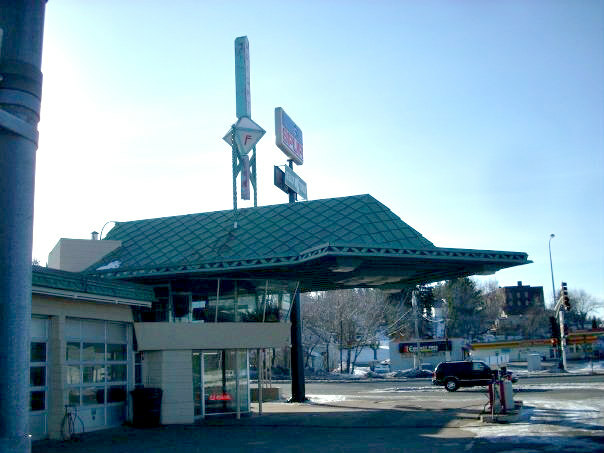 But did you know he also designed a gas station once, and it’s right here in Minnesota? 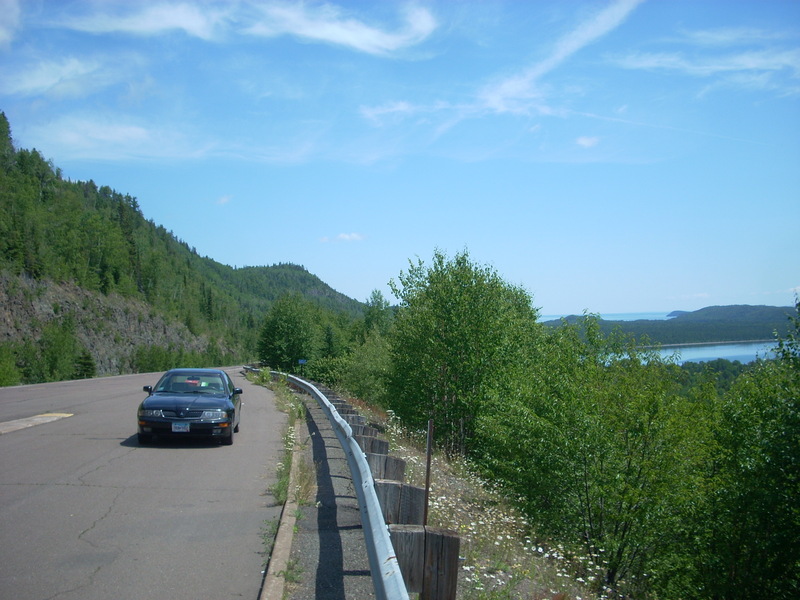 Located in Cloquet, just outside of Duluth, is the iconic R.W. Lindholm Service Station, a gas station and service shop with many of Wright’s signature motifs. 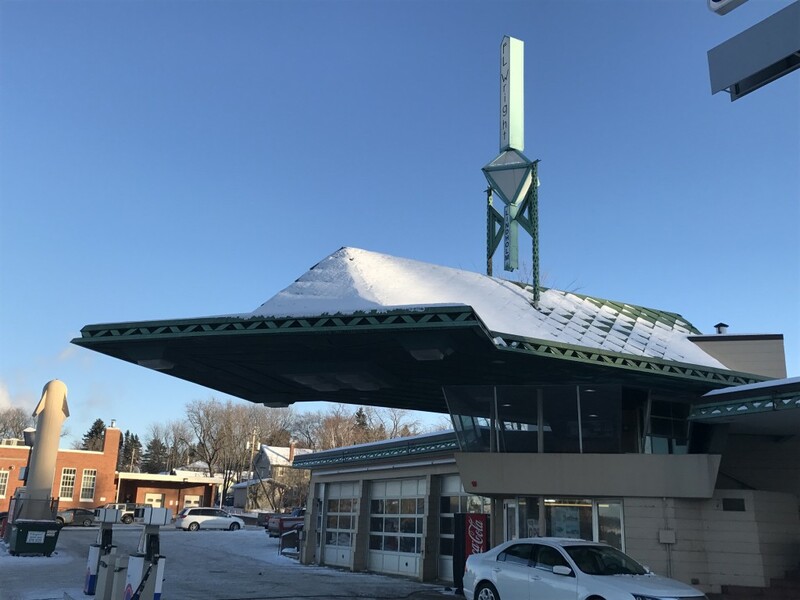 It features an arrow-shaped, cantilevered overhang topped by a grid-like copper roof, and an upper level “waiting room” with large glass windows looking towards the nearby St. Louis River. 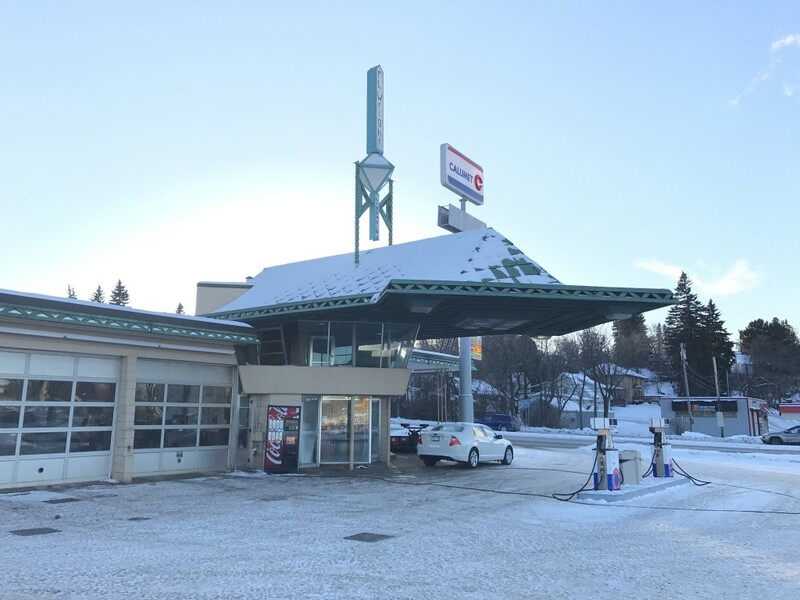 It has changed owners and franchises several times, but the timeless, functional service station remains open to this day. Frank Lloyd Wright had designed a home for Ray Lindholm in 1952 just outside of Cloquet, which was recently deconstructed and moved to Pennsylvania in 2016. Around this time, Wright was also designing his own Utopian “Broadacre City,” which aimed to revitalize the urban landscape into an interconnected, sprawling landscape of technology and natural harmony. However, the Service Station was the only part of this plan that was ever realized. Broadacre City was detailed in several books by Wright, notably one titled The Disappearing City, and he worked on this project most of his life. He unveiled a 12×12′ scale model of the planned community at one point, which is now on display at the Museum of Modern Art in New York City. Although his full-scale communities never came to fruition, Wright continued designing right up until his death in 1959. His apprentices, students, children and grandchildren even kept his visions alive in their work as architects. As of 2018, there are only 10 remaining Frank Lloyd Wright houses in Minnesota. He designed around 400 total in the United States, along with many commercial buildings, such as a medical clinic in Hastings, MN, or the famous Guggenheim Museum in New York. 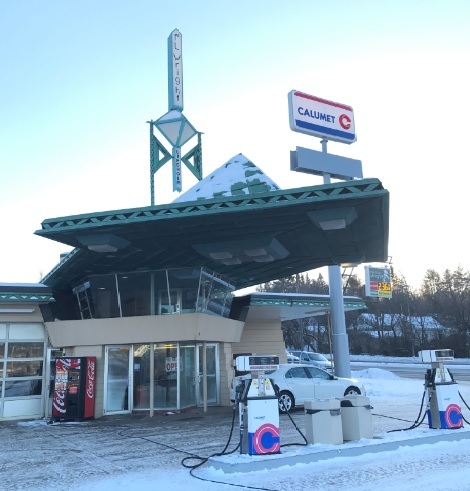 But the only gas station on his résumé appears in the small, charming town of Cloquet, and many people who stop by have no idea of what it is. But you do now, and you should go check it out if you’re ever passing through. 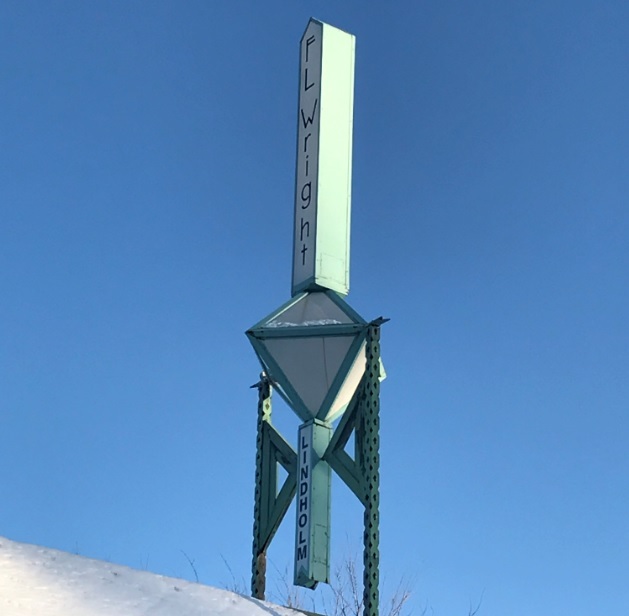 While in the area: Cloquet features some roadside attractions like a Voyageur statue and a Dala Horse, and if you pass through in warmer months, check out Gordy’s Hi-Hat, a local burger joint once featured on Guy Fieri’s show Diners, Drive-ins, and Dives. Thanks for this info on the Wright gas station. I’ve never been to Cloquet. 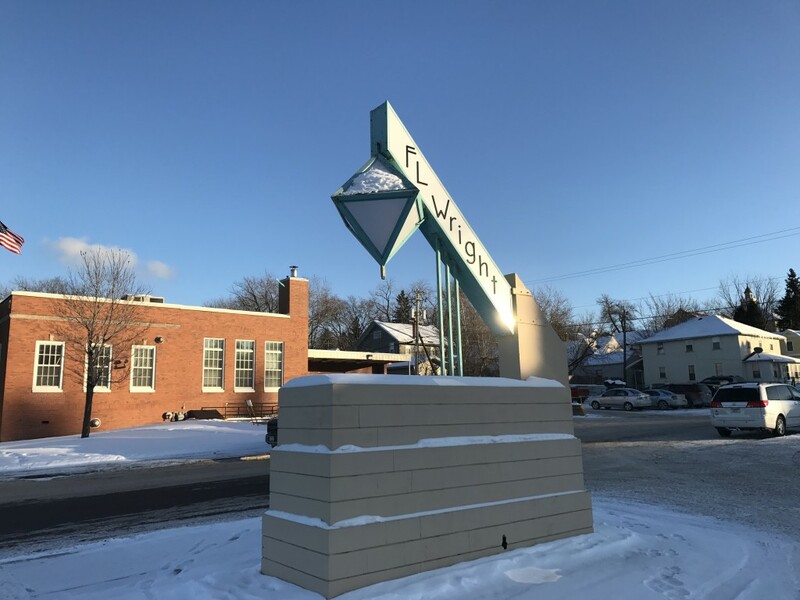 Have you seen all of the Frank Lloyd Wright houses and the hotel in Mason City, Iowa. It’s not that far across the border and worth the visit there and to neighboring Clear Lake. I wasn’t aware of the Wright medical clinic in Hastings or the 10 houses in Minnesota. Any idea where those are located? I have never been to Mason City, but it sounds interesting. Below is a link to all of the homes in Minnesota. I have seen them all except the Rochester ones. If you decide to visit Mason City and/or Clear Lake, Iowa, check my posts from both. Just type the city names into the blog search engine.